Teamed up with Italian helmet manufacturer AGV, the Diesel Mowie is a fighter pilot inspired open face helmet designed for the scooter market.The AGV Diesel Mowie helmet presents very polished details: fabric and leather made in Italy, the mythical "Diesel Mohawk" in high density raised leather, shiny chrome raised logo on the back, and padded ergonomic neck protection which is a removable cold weather neck roll attached with a zipper. One of the most obvious features of the Mowie is the flip-down fighter pilot shield made out of anti-scratch polycarbonate and is also available in smoked, yellow, orange and green. The helmet ships with a clear with a UV filtering visor. There is a gasket at the top that creates a seal to keep the weather out. The shield works well in blocking wind on city streets, but at highway speeds the cool looking eye protection may provide too much air. The cloth lining is fully removable and washable with the diesel logo. 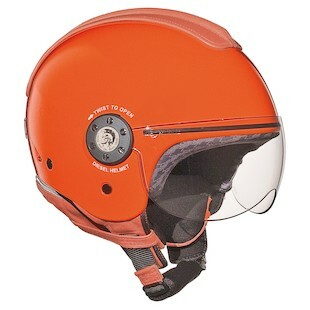 Light and DOT rated, the helmet comes in two shell sizes and a range of eight colors. A micro ratcheting system on a padded chin strap makes it secure and easy to adjust. 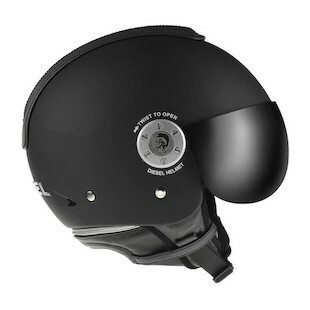 The construction and detail is impressive for a scooter helmet due to its function, style and quality. The helmet comes in a cool army green carry bag. The Mowie represents another solid collaboration from AGV Helmets and Diesel. 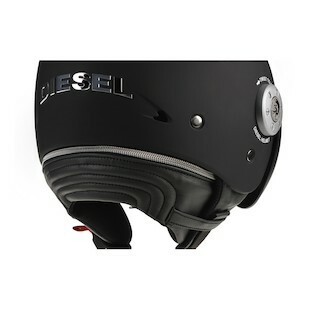 To see all options in this category, visit our open face motorcycle helmets section.